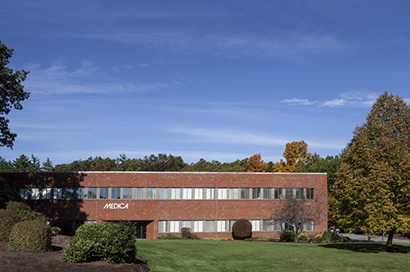 Medica Corporation is located in Bedford, Massachusetts, in the Greater Boston area. The company is served nationally and internationally by Logan Airport in Boston and Manchester Airport in New Hampshire. On Route 128/95 south, take Exit 32A for Middlesex Turnpike/Rt. 3. Take Route 3 north to Exit 26 (Route 62). Go straight at the end of the exit ramp, crossing over Route 62 onto Crosby Drive. Follow for 1 mile. Turn left onto Middlesex Turnpike. Follow for 0.38 miles and turn left onto Oak Park Drive. Medica is number 5 Oak Park Drive. Take Route 3 south to Exit 26 (Route 62). Turn left onto Route 62, then first left onto Crosby Drive. Follow for 1 mile. Turn left onto Middlesex Turnpike. Follow for 0.38 miles and turn left onto Oak Park Drive. Medica is number 5 Oak Park Drive. Go through tunnel to Route 93 north. Travel for 11 miles on 93 to Exit 37B (Routes 128/95 South). Travel 6 miles to Exit 32A onto Route 3 north. Follow for 2 miles to Exit 26 (Route 62). Go straight at the end of the exit ramp, crossing over Route 62 onto Crosby Drive. Follow for 1 mile. Turn left onto Middlesex Turnpike. Follow for 0.38 miles and turn left onto Oak Park Drive. Medica is number 5 Oak Park Drive. Take the Mass Turnpike/90 east to Route 128/95 north. Follow 128 to Route 3 north exit. Take Route 3 to the first exit, Exit 26 (Route 62). Go straight at the end of the exit ramp, crossing over Route 62 onto Crosby Drive. Follow for 1 mile. Turn left onto Middlesex Turnpike. Follow for 0.38 miles and turn left onto Oak Park Drive. Medica is number 5 Oak Park Drive.